このサイトはシクロクロスを楽しんでいる、もしくはこれから楽しもうと思っている方々のためのサイトです。 レース結果を基に作成したラップタイム表など、シクロクロスをもっと楽しむために個人的に作成した資料を置いています。 個人的に作成したものではありますが、皆さんがシクロクロスを楽しむ手助けになれば幸いです。 Welcome to the site. 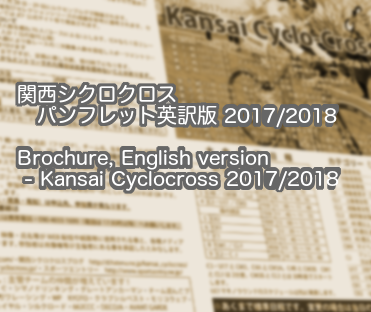 This site is intended for the people who enjoy and/or have a plan to enjoy the cyclocross, especially the cyclocross held in Japan. Lap time charts of the cyclocross in Japan are available. I hope this helps you enjoying your cyclocross life. Some data and charts for the cyclocross held in Japan are available. The following contents are prepared based on the race results from AJOCC website. You can find the lap time tables for Kansai-CX in 2011 to 2016 here. You can find the point ranking charts for Kansai-CX in 2016 season here. Please contact me If you have any comments and/or issues about this site.